Newly-crowned Malta champions Valletta are expected to accelerate their search for a new coach in the next few days after Andrè Paus agreed a deal to take charge of Cypriot club Anorthosis Famagusta. Appointed head coach of Valletta in the last week of January, Paus guided the team to a league and cup double but he has turned down the club’s offer of a new contract in favour of a move to Anorthosis. Anorthosis Famagusta have long been mooted as Paus’s next destination after Ted van Leeuwen, who had a short spell as technical director of Valletta, signed a three-year deal to head the Cypriot club’s technical sector. Anorthosis have had a disappointing season in Cyprus’s top league. With one game remaining, Anorthosis, who are 40 points behind leaders and title favourites AEL Limassol, can’t finish higher than sixth. Last weekend, they suffered an 8-1 drubbing to APOEL Nicosia. Now that Paus has ended the uncertainty over his future by agreeing a three-year deal with Anorthosis, Valletta president Victor Sciriha is expected to hold talks with the other candidates for the job. It is believed that the champions have already ruled out the possibility of re-appointing Mark Miller as head coach. Miller took over at Valletta at the start of season 2012/13 and remained in charge of first-team affairs until January when the club, with the backing of sponsors Insignia, brought in Paus in a bid to boost the team’s chances of overhauling Birkirkara in the title race. Miller served as first-team coach under Paus but Valletta have not renewed the Englishman’s contract. Jesmond Zerafa, the former Valletta player who led the club to back-to-back championships in his two years in charge, has been linked with a return to the capital club. Zerafa coached Balzan last season after replacing Italian Riccardo Tumiatti in October. 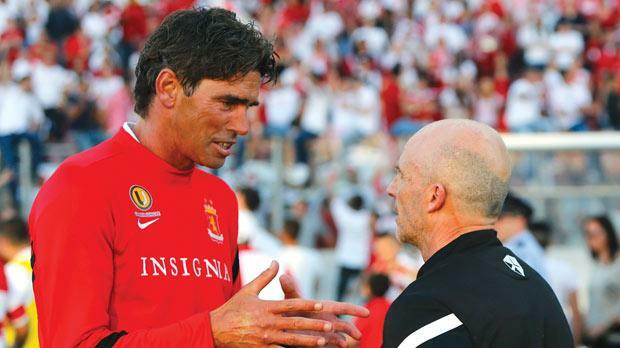 Despite guiding the team to a top-six finish, Zerafa has parted ways with Balzan who have all but concluded talks with Oliver Spiteri to become their new coach. Spiteri was at the helm of Vittoriosa last season. Meanwhile, Sliema Wanderers have long been engaged in discussions with a group of foreign investors who are keen to embark on an exciting project involving the Premier League club. Sources have told Times of Malta that Keith Perry, the president of Sliema Wanderers, has been working on this venture for several months. Sliema have kept details of this project under wraps so far but if it were to materialise, the Premier League club’s progress next season would feature prominently on a renowned sports channel in Italy. The people behind this venture are reportedly prepared to allocate a significant budget to recruit a high-profile coach and top players for Sliema Wanderers who have qualified for the Europa League next season after reaching the U*Bet FA Trophy final where they lost 1-0 to champions Valletta.